I've been a big fan of Elf (Dune's sister, vegetarian restaurant in Echo Park) since I moved to LA 5 years ago. It's small, smells amazing, the staff is sweet and the food is rich, fresh and savory. I was over the moon when I heard Elf was opening a little Mediterranean-inspired outpost in Atwater. I couldn't wait to try the lamb (is it just me or is there a serious shortage of lamb schwarma in this city? ), but surprisingly, the beet and feta sandwich is my favorite. After I'm sated, I walk across the street to browse around at Individual Medley or head north on Glendale to pick up a crystal or some incense at the Crystal Matrix (lay off me, it's SoCal). 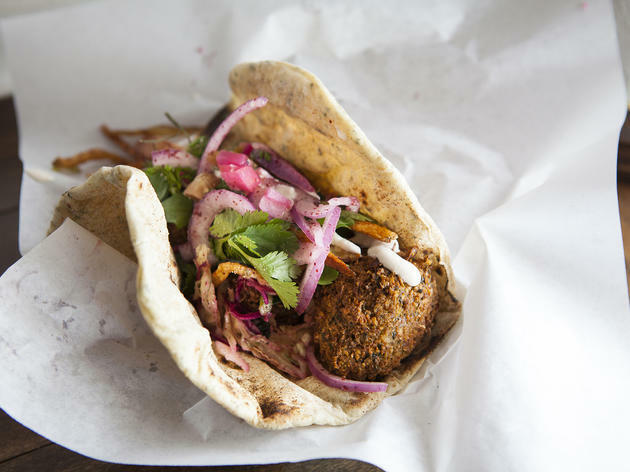 Dune popped up one day in Atwater Village and promptly changed our minds on what we thought amazing falafel tastes like. The menu, which started off scarce, has continued to grow and this hole-in-the-wall has definitely made a name for itself as a rising star in Los Angeles' burgeoning nuevo-Mediterranean culinary explosion. 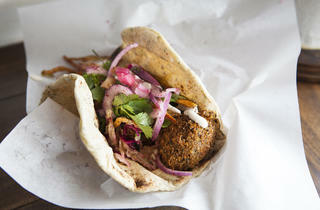 The falafel is top notch, like, really good. But don't go neglecting the lamb, because it is delicious and, quite frankly, off the chain as well. Dune is just another fantastic reason to visit the already awesome Atwater.